When Sarah first mentioned going to Antarctica it was all part of some far away dream that would never happen. At least I remember thinking of it that way when she first mentioned it. I mean who goes to Antarctica? Yet somehow we got to a point a few years ago where we were sitting on our bed talking over whether or not she should accept a position to be the doc for a US research base, yes, in Antarctica. I bring this up now because in preparing for a trip to the Canadian high Arctic and parts of Greenland people were generally confused. Why would we want to go there? What is there to see? I realize I'm beginning a long post by talking about how we ended up in the Arctic (I can already hear Sarah's sweet voice saying "Keep it short and show them amazing pictures. "), but I feel it is important to describe the 'why' of how we started even though the photos make it quite obvious, at least to me. And to keep it short I will sum up by saying it like this. What started as a rugged and worn out attempt to follow my wife to Antarctica has kindled a personal passion within me for exploring the polar regions of this planet to match or, dare I think it, even surpass hers. This is an important note for those who know us so forgive the explanation otherwise. Why travel to the Arctic? Well, we clearly desire to but why would someone else want to go? Did you see stop to look at our first photograph? A mother polar bear with a cub standing over a beluga whale carcass!?!? No, not an animated polar bear drinking a coke. We saw polar bears in the wild! Is the 'why' making any more sense yet? But we are getting way ahead of ourselves to the story of this trip. 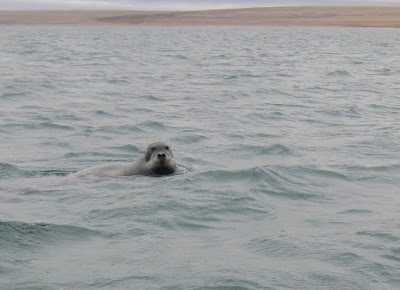 This post will be about roughly the first five days of two Arctic cruises we went on with a company called Quark. Sarah took a job as the ship doc and off we went on a flight from Guam to Edmonton. After arriving in Edmonton and going on a quick excursion to grab some cold weather gear, that surprisingly enough, we could not find in Guam, we met our first Quark employee named Acacia. She was very nice and made us feel right at home. Later we learned Acacia is a professional photographer from Alaska who has traveled the world extensively with tons of experience in the Arctic. This ranges from skiing long distance races of the mountains in Greenland against the Prince of Denmark to learning to hunt seal during an Arctic winter with a dogsled team. Seriously? Yes, and as mentioned, she had some breath taking photos to prove it. Click that link to check out her stuff. I was to find out this was a Quark employee standard. Everyone we met on our trip was vastly experienced, but you will meet some of them as we go. After meeting Acacia we got settled into our last night before our voyage deep into the Arctic. I had read the itinerary a few times but it can be difficult to remember some of the Nunavut names for the communities we would be visiting. I actually did best with this first one called Kugluktuk. Any words highlighted like this will be linked to a page where more can be learned about the word, community, people, etc. Kugluktuk for us was the place we were flying to so we could embark on our boat for the cruise, but it is a community with a lot of historical influence in the Arctic world. We did not get too much time there but fortunately we were able to check out their community center while getting our nice yellow parkas, the jacket Quark gives to the passengers to make sure they can all stay warm and dry on our ventures. The first three pictures are all from this community center. Note in the first with the yellow parka distribution the walls with flags, skins, decorations, and even a sledge. I had never seen most of these symbols or flags. Super interesting stuff. The second picture is posted because it just happened to be part of the Circumpolar games which were taking place while we were there. I know very little of it except for what was told to me briefly but I have now come think of it as a the Arctic Olympics. Every four or five years they gather to compete in various bouts ranging from seal hunting to the Alaskan high kick to Muskox wrestling. The third picture was part of the games in action. A weighing and measuring of some kind from their fishing portion to see who won. The cardboard and fish were strewn about in their local hockey rink, minus the ice. Yes they have hockey and yes the little ten year old hockey player in me was thrilled to stand in the rink even without ice!! The map. Before moving on I just wanted to make sure there was a general idea of where this trip started and took place. 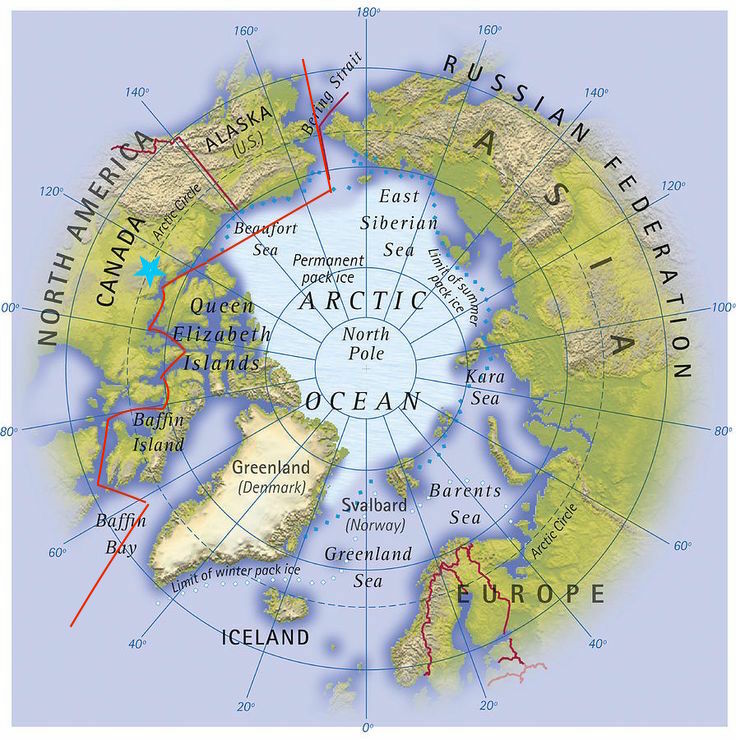 The star represents a generally close mark for where Kugluktuk is located. 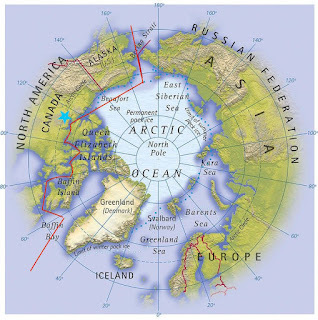 The red lines show where a Northwest passage takes place as closely to ours as possible using this map and my willingness to spend time doing it. A Northwest Passage crossing can take any of the many passages through but often some or all will fill up with ice which can make it difficult or even impossible especially depending on the boat. This is in contrast to the Northeast Passage which would traverse the opposite direction near Asia. Makes sense right? Think a little West of where Santa is supposed to live. Now that everyone is for sure picturing the Northern part of our globe on the mostly Canadian side, lets move on. From Kugluktuk the trip truly began!! Notice our boat named the Sea Adventurer. Built in Yugoslavia in 1976 for the purpose of taking Russian officers and their families on nice vacations, this boat has a nice shallow draft specifically designed for traversing the ever suddenly shallow and at times unchartered or worse poorly chartered Arctic waters. She and the crew took great care of us! As the picture here shows, the process on and off the boat for disembarkation or embarkation is quite a sophisticated zodiac performance. Quark has perfected this essential aspect of the journey. So much of what we experienced and saw would have been impossible without zodiac excursions, which they could do with over 100 people all at once. Super cool. Speaking of excursions, and the best part of the story! Our first day we jumped in our zodiacs and went shooting off towards the shore. The first thought I had was a visual picture of myself in complete awe with my jaw slack as I stared like a goofball at all of the amazing colors offered by the Arctic tundra. Yellows, greens, deep reds mixed around and embrace vast rock structures. So different. So vast. So empty. So unexpectedly alive! Then it happened. Someone spotted the first of our trips wildlife! Besides birds that is of course. Sorry Lilliana, our boat ornithologist. An Arctic Hare had been seen on land so all our boats nearby hovered in close. By the way you have already seen it. It is in the photo just after the one with the boat. Did you see it? It's not white yet for the winter so look closely. The next picture is zoomed in on the hare a little more. Do you see it yet? Sorry we don't have one of those zoom lens for our camera longer than my arm. See it yet?? took amazing cautions to ensure this would not happen. They are trained and ready to protect us with lethal force against one of the strongest predators on this earth, but wanted more than anything to keep from allowing such an encounter to occur because such an occur. Apparently polar bears are sneaky though and in the vast arctic expanses they can pop out of no where, hence our highly trained crew. Ok. Did you see the hare? I tried to make it super easy. It was easier with binoculars. I'm smiling thinking of my mom squinting at that first photo. But it is fun to go back and look right? "tundra" a long time ago with all of my other geography terms - plains, cliffs, oceans, and tundra. Tundra. Just say the word a few times. Oh and do you remember what it is? Something to do with the frozen layer of a permafrost right? What's permafrost? Well I want a bed made of tundra. It was so soft. I realize this is a temporal thing and during a different time of year my tundra mattress would go from squishy to super firm. But still, to heck with the rest. I'm getting a tundra mattress next time. Sarah and I are pretty bad at taking pictures of ourselves or getting them taken of us, but this self portrait is my attempt to make sure we are posting them every now and again. I think my hair has decided it's moving more to Clooney than to Pitt. Yes my hair is vain and thinks grandiosely. Doesn't this photo make you want to just run off into the expansive beauty? Get your running shoes, some polar bear deterrent, and some swim trunks. By the time we landed for these shots we had already been up into the waterway pictured here in the zodiacs exploring. Water everywhere. Rivers and inlets and shallow pools. Did you notice the color of the water? Pristine landscapes mixing with rugged mountain and rock - just amazing. On landings like this we were allowed to just wander around as long as we stayed within the protective perimeter. As the photos and posts will show, we would wander up upon a artifacts, bones, spot animals, study rocks (yes the boat had an expert geologist too), learn about the Arctic plants, see cairns, and then just stop to stare off at the horizon. I suppose if we look closely enough in any environment we can find the strange balances that exist all around us, but I do not recall ever being somewhere so starkly set in juxtaposition to itself. Maybe the polar bear is a good example of what I am trying to put into words. When I think of a polar bear I know at some point the thought will end with, "But maybe I could be the one person to successfully have a polar bear as a pet." They are fierce killing machines almost constantly wandering in search of their next meal, but their beauty appeals to me and forces me to wonder beyond their ferocity. Don't worry, our polar bear experts told me what would happen if I tried to wander up and hug one of them. Beauty mixed with one of the most difficult to live in environments on earth. It is truly an amazing place. So if +Scott Smith, +Austin Russell, or +Mark McBride are reading this post they are all thinking a mixture of the same thing. "I want to go kayaking in the Arctic! That punk is so lucky!" Let me pause and say Sarah and I are both blessed beyond measure with the lives we have lived so far. From great parents to fantastical adventures most folks only take post seventy (trust me I know based on the average age of the boats), our lives have been a fabulous venture of awesome. We are grateful and we do acknowledge how special these opportunities are for us. Having said that, I went kayaking in the Arctic!! Sarah's duties kept her from joining but thanks to someone who backed out I found myself on the exclusive Quark kayaking crew. Oh yes! There are a few limitations about kayaking. Sometimes the kayakers go out when the rest of the folks go zodiacing out to explore. Zodiacs can get closer to ice bergs (safety issues), etc. But it's totally worth it!! What an amazing way to get some exercise and feel the terrible vastness of the Arctic waters. I tried to constantly remind myself of those who have died searching for the Northwest Passage or on other ventures in the areas we were exploring by kayak. Sobering thoughts that kept my mind on safety. The whole experience was extremely mental for me. I was almost always a mixture of awe towards the Creator and what I could learn about God through experiencing the Arctic, with plenty of stupid selfish joy in how much fun I was having while doing so. Yes we did get back on the boat, ate food, met wonderful people, sat through fantastic talks by truly great folks, and many other spectacular things (maybe I'll share a story or two along the way). But it's the animals that stole the show for us, with the scenery taking a close second. Eventually I'll give more details about the actual voyage. For now it's just a string of animal encounters. these beautiful muskox. Sorry again for the lack of zoom but I promise they are those brown looking rock things. Click on their name for what they really look like and what we saw through the binoculars. It's a national geographic site so you'll see some sweet photos. It was quite the treat to see these ancient looking creatures. Did you click on the link? They are truly unique in appearance. Before our trip I looked up info on all the animals I thought we might see. Muskox, the sight I read said, is known for two things. It has really thick and warm hair. And during the rutting season they put off a really strong scent which is quite musky. They are of course much more interesting than this basic definition I read but it made me laugh and so I shared it here. But wait, while we were leaving the muskox we heard over the radios a little bit of chatter. Could it be? It could! A polar bear sighting!! And yes you have already seen it in the photo. We were not able to get super close to the bear but there it was and through our binoculars Sarah and I were calmly freaking out. A polar bear! Not in a zoo. Not on some amazing David Attenborough documentary. There in the flesh was a giant polar bear wandering around and we were seeing it with our own eyes! This moment will be high up there in those I take note of later in life, assuming I make it there. Mom is cancer free. Bevin and Jamie are pregnant. That day my heart felt the joy of Christ as Lord. My father and the brothers all around a fire, Chad is a Baddorf. The park with Sarah where we decided to give our love a shot. Youth pastor moments. Learning of Charlie's existence. There are moments that cling and so many more than listed here for Sarah and for me. Seeing a polar bear has changed me. How? Time will tell. Yes, everyone is thinking the same thing. This is the kind of over sharing Sarah was talking about. Ok, I'm moving on. No joke, while we were watching our first polar bear guess who was watching us? Bernard the bearded seal. 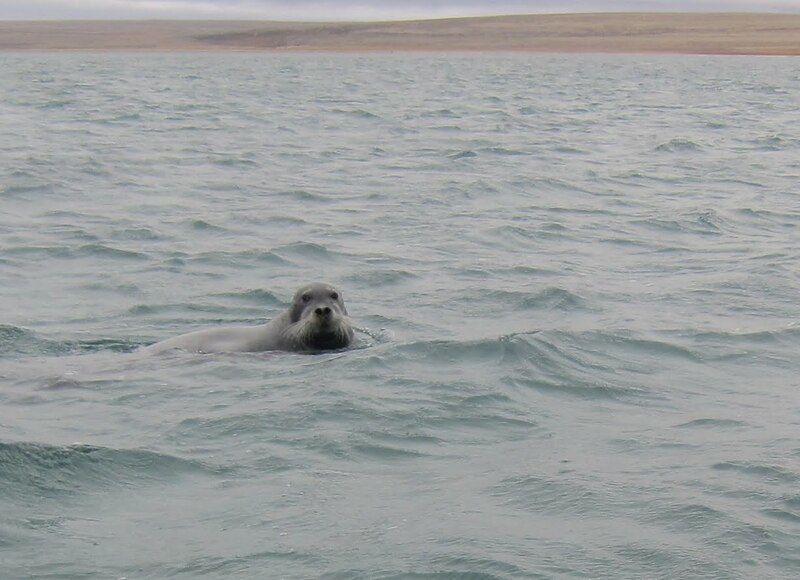 No his name is probably not Bernard and yes if you have not heard there is an animal called the bearded seal. And this is now +Bryan Baddorf's favorite animal in the world? Most likely. Sarah took this shot and I could not believe it when I was looking through her photos after the trip! Great shot honey. I found it really difficult catching the moving wildlife in the moving zodiacs. The above photo is one I am most proud of from our trip. Not necessarily because of the shot I managed to take but because of seeing this guy. Have you seen an Arctic fox in person? Neither had I until this day. I was in the first zodiac of passengers who made it on the beach. While waiting for the other passengers I gazed down out across to my left to peer down the shore when I barely noticed movement. What's that? Binoculars ready I pulled them up. A dog? No it's way too small. Wait it can't be can it? Could it be? It's coming towards us?! This Arctic fox sauntered up the beach towards us, moved about ten feet around our rectangular perimeter, and then continued to slink down the beach with never a care that we were even there. I was pumped up and sad Sarah had missed it all. That is until when she arrived I discovered she had already seen the fox with the landing crew. She had not missed it after all. But I do wish we had seen it together. This guy fooled me some at first because he had not yet transitioned to his white and much more recognizable fur they have for winter. Sarah and I then saw an adolescent snowy owl. Really cool, and really big considering it was not fully grown. Apparently snowy owls eat a ridiculous number of lemmings a day to exist in the Arctic but we won't hold that against them because they are so regal looking. No picture because it was so far way. Look to the link at the bottom of this post for the amazing shots we got that day as there was some great scenery. More polar bears? 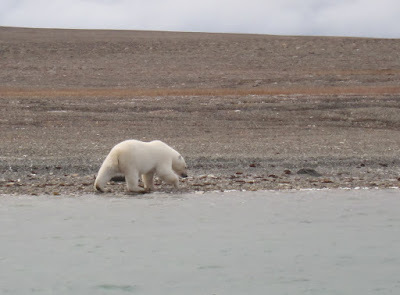 Ok. Our first polar bear experience was amazing and monumental but a pretty good distance off from us. Then we come upon this behemoth pictured above. 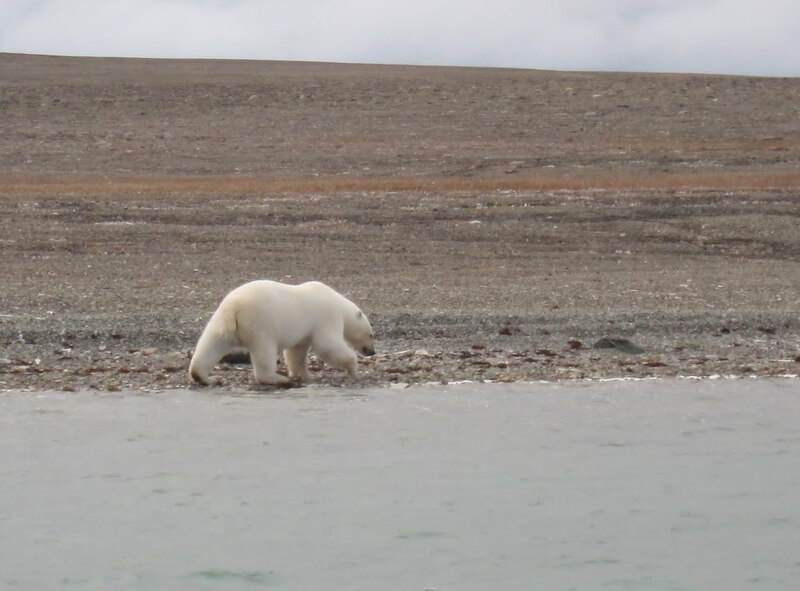 This male polar bear was walking up and down the shore of a small point scrounging around, taking not much notice of the twelve zodiacs or so humming about 100 yards away. And would you believe me if I said no more than a mile, maybe less, down the shore was a momma and cub?? Yes!! So we lounged with this guy for a while and then went down to adoringly gaze at mom and cub. Yes my head is still spinning from seeing a cub. And such a cute one. Look at that little guy/gal! I love the shot of them looking at each other. And yes I did consider swimming the cold waters to see if she would let me hug the cub. I mean you never know till you try right? Well my summary of our first five days has become an animal to animal jumping with no clear description of what day it is or where any of these things happened. I do promise more of the trip details will make their way in as I get sucked into explaining some of the history and the route. One of my favorite parts of this journey was just being where so much historical exploration has taken place. It is truly unique and I cannot wait to share more! !